Quinoa has quickly become one of my favorite healthy go-to main course meals. Being creative with this fabulous “seed grain” is simple and fun. It’s the base for this powerhouse all-in-one meal. Prep time is less than 20 minutes but requires an hour bake time. And that means you get to smell the aroma of a tasty, healthy dish while it bakes! The fall weather calls me to my oven for this dish that is truly amazing in flavor, and calls for minimal ingredients. Let’s get cooking! Heat oil in a large skillet and over medium heat. Sauté onion and celery for about 5 minutes, until soft, add cumin, herb seasoning, and garlic. Cook for an additional minute. Stir in cooked quinoa, stir well, and add ½ jar pasta sauce. Stir and cook for additional 5 minutes. The mixture should be thick. I like to do a taste test, and add additional seasoning if needed at this point. Preheat oven to 350 degrees F, pour a small amount of reserved pasta sauce in the bottom of your square baking dish (I love to use stoneware). Place the prepared, halved bell peppers in the pan and they are ready to stuff. 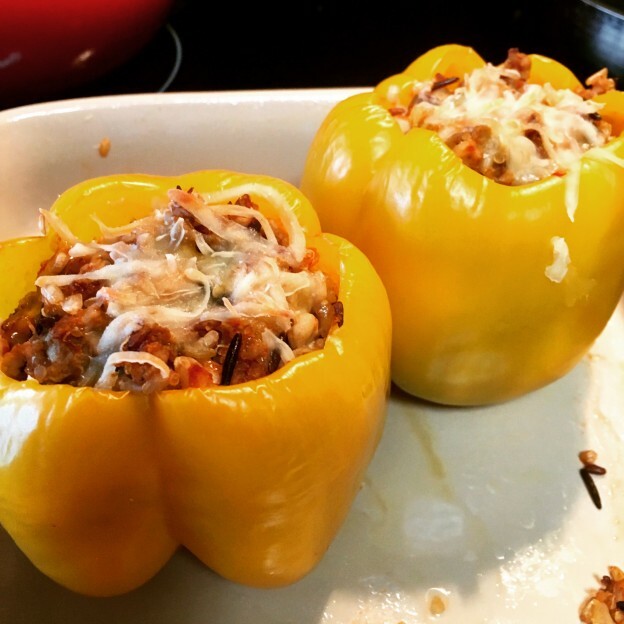 Fill each halved bell pepper with the quinoa mixture, making sure each pepper is filled with the same amount. 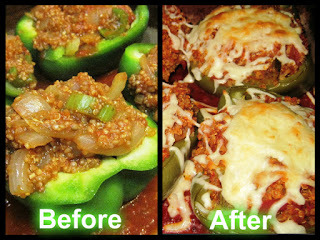 Cover with foil and bake 50 minutes, uncover and sprinkle a small amount of cheese on top of each pepper. Place back into oven, uncovered and allow the cheese to melt (approximately 15 minutes). Recipe yields 4 nice size stuffed peppers. Enjoy!